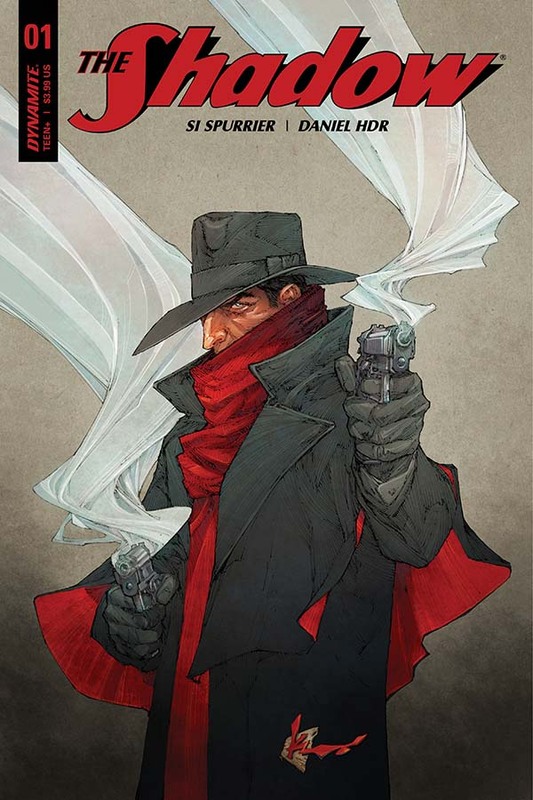 This summer, Dynamite Entertainment and Condé Nast will welcome readers back into the know with the launch of their latest incarnation of the classic pulp character the Shadow, in The Shadow: Leviathan. Launching in August, the comic-book series will feature writer Si Spurrier (X-Force, X-Men: Legacy, Judge Dredd) and artist Daniel HDR (Superman, Cyborg), who will bring the pulp icon into modern day in a tale full of deadly intrigue, gun-blazing action, and a study of the nature of evil! For the better part of a century, the Shadow's sinister laughter brought the chill of fear to evil-doers - but in our modern times, the streets of Manhattan have gone largely silent. But he is not forgotten. Not by the people he's saved. Mary Jerez, is one of those people. The Shadow saved her from a horrifying school shooting - Mary knows all too well what evil lurks in the hearts of men. So when a horribly burnt man - incredibly strong and fierce, despite these terrible injuries- arrives under her care as a resident at the hospital - she believes she knows who he is, too. Is this mysterious man actually the Shadow - and with Mary's help, will evil-doers again know what it means to fear his terrible justice? 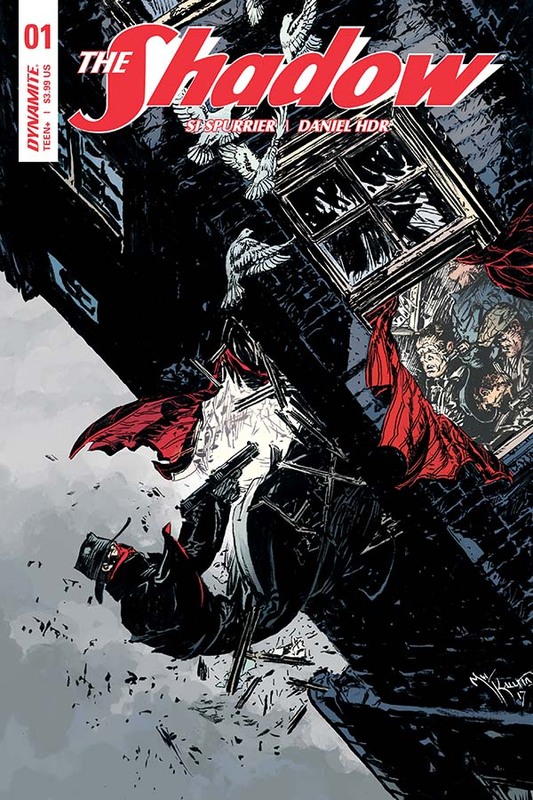 Writer Si Spurrier says, "For me - and I suspect for most comics creators - The Shadow is an irresistible property. The hat and scarf, the cold eyes and colder laugh, the wisp of cordite and the flourish of a cape: all plucked wholesale from the noir pulps and radio plays of the 1930's. You don't say "no" to a true primogenitor like that. On the taxonomical chart of Western comics he's a common ancestor for a sizeable chunk of the marketplace. Every street vigilante, every masked crime-fighter, every necessary monster: he's in the DNA of them all. A living fossil, a coelacanth or goblin-shark for the comics world, swimming in waters of ice and ink. And like all perfectly engineered things he endures - he flourishes - amidst newer, cockier, less perfect specimens. Spurrier added, "What I most love about the Shadow is, like all good legends, he tells us even more about the present than the past. In this new story I'm dragging the legend into the modern world, with all its melting-pot problems and changing attitudes. This isn't the world the Shadow was born into, with its pinstripe gangsters and mystic monsters (although we'll be visiting that one too). Instead our main story unravels in a world of corruptions and petty politics, prejudices and hate. A world with a frightening new regime taking control. A world where true power lies not with those who hold the reins, but with those who control the story. How can two guns and a devil's stare fight the 21st Century? I couldn't be prouder to be telling this tale. With the exceptional Daniel HDR by my side, The Shadow: Leviathan is a smart, slick, brutal takedown of today, with nothing less than a living idea holding its finger to the trigger." Simon Spurrier is a writer of comics, novels and TV. His most recent works include Cry Havoc, Doctor Who, X-Men Legacy, Godshaper, and the Eisner award nominated science-fantasy series, The Spire. His latest prose novels are Contract and A Serpent Uncoiled, while his first digital-only project is the "absurdist-noir" novella Unusual Concentrations. Artist Daniel HDR says, "My first contact with The Shadow was during my teens, 15-16 years old, when the character was given a new revamp by Howard Chaykin. Also I was aware of the previous incarnations thru old fanzines. The character and everything that surrounds him is an invitation for any artist to play around with graphic storytelling, and I love that possibility! Also, Si's script is challenging and so damn dynamic! I can't wait for people to read the book!" "We've wanted to work with Si for years, and had not been able to find the right project to match his schedule. In looking to relaunch The Shadow, we wanted a fresh new voice, and we were able to make the schedule work with Si's schedule," says Dynamite CEO and Publisher Nick Barrucci. "Si's story is crisp and takes The Shadow to new depths. And Daniel's (HDR) art is nothing short of magnificent! I cannot wait for fans to read this incredible new series." "We look forward to building on the success of the Batman Shadow crossover with this new series from Dynamite," said Cathy Hoffman Glosser, Senior Vice President, Licensing at Conde Nast. "Going forward, we will continue to tap into our incredible library of famed Street and Smith characters in new and exciting directions." The Shadow began its existence in 1930 as a narrative voice on the Street and Smith radio program Detective Story Hour. The audience thrilled to the serialized adventures of this mysterious figure, whose mythos expanded to include Occidental mysticism, hypnotic powers over weak criminal minds, and twin .45 caliber handguns. With a keen intellect and relentless drive, The Shadow hunted criminals without mercy in an era when gumshoe detectives and bootlegging mobsters was a thrilling yet fearsome reality. The character's popularity has endured for over 80 years, bolstered by appearances in radio serials, novels, comic books, films, and more. In recent years, Dynamite published a groundbreaking and well-received Shadow series launched by comic writer Garth Ennis (Preacher), with further tales crafted by Victor Gischler and Chris Roberson. 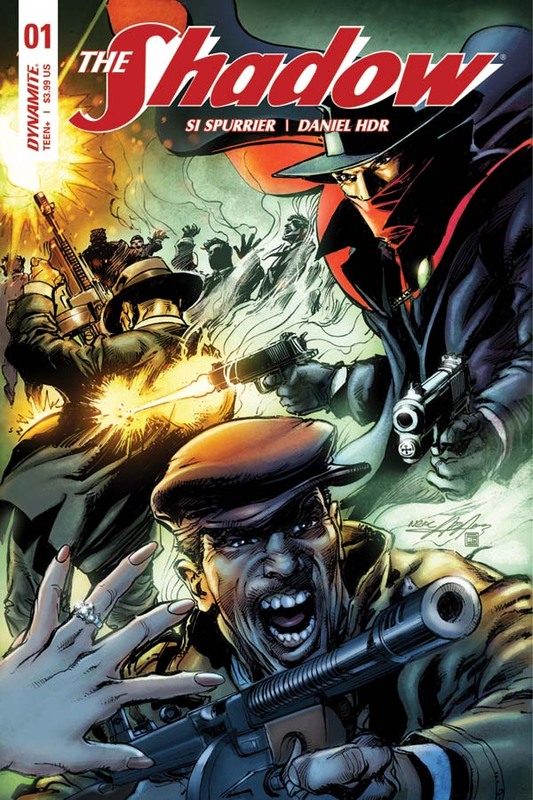 Lamont Cranston's grim alter-ego has also appeared in such related series as The Shadow: Year One, Masks, and The Shadow / Green Hornet: Dark Nights. The debut issue of The Shadow features a wide selection of cover variants, providing fans and retailers with the freedom of choice! The cover artwork features the talents of Kenneth Rocafort (Superman, Teen Titans), interior artist Daniel HDR, Aaron Michael Kaluta (The Shadow), Brandon Peterson (Uncanny X-Men), Neal Adams (Batman, X-Men), and Tyler Kirkham (Amazing Spiderman, Strykeforce), respectively. Limited variant editions in "Black & White" and "Virgin Art" formats are also available as retailer incentives for comic shops that support the launch issue by achieving stocking thresholds. 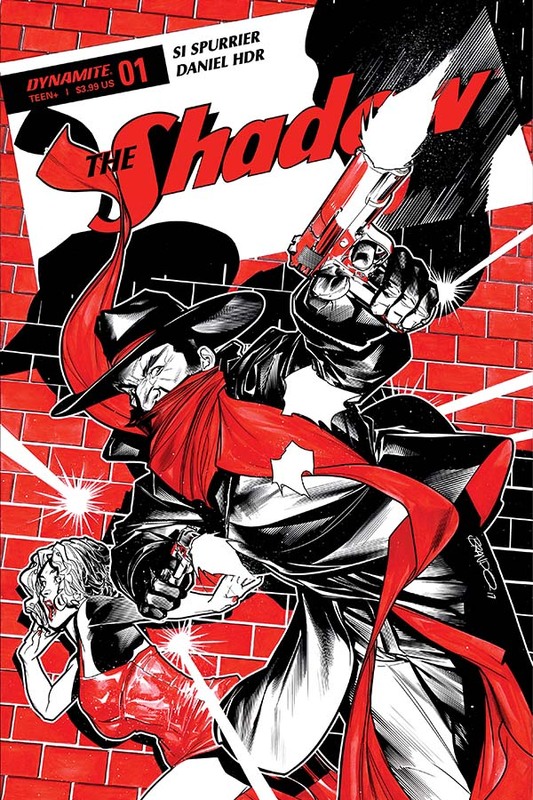 The Shadow #1 will be solicited in Diamond Comic Distributors' June 2017 Previews catalog, the premier source of merchandise for the comic book specialty market, and slated for release in August. 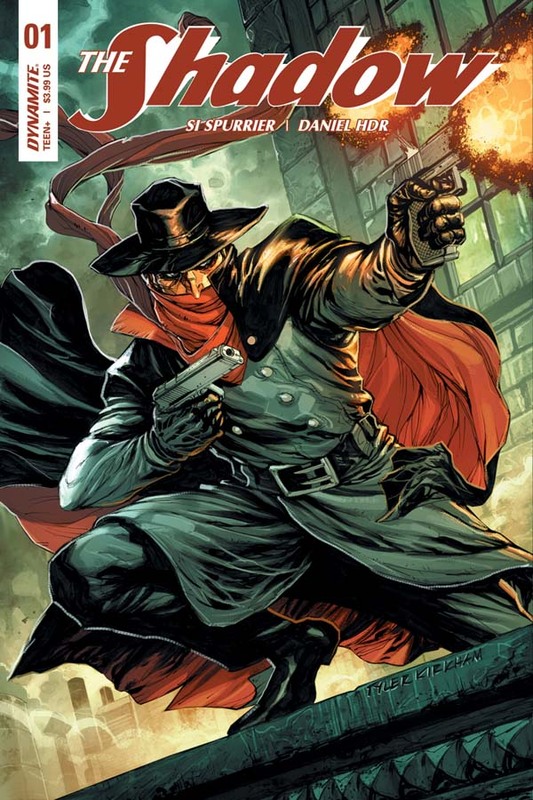 Comic book fans are encouraged to reserve copies of The Shadow #1 with their local comic book retailers. The Shadow #1 will also be available for individual customer purchase through digital platforms courtesy of Comixology, Kindle, iBooks, Google Play, Dynamite Digital, iVerse, Madefire, and Dark Horse Digital.